Clincher tires work great on aluminum alloy rims, but what happens on carbon fiber wheels? The biggest problem on a typical carbon fiber rim is that the compression strength drops to approximately one-tenth the strength of aluminum for a tire inflated to 145 psi (from about 42,000 psi to 4,608 psi). Which means that the traditional hook-bead style tire retention system on a carbon wheel is fraught with potential failure. Enter Lew Racing. The Lew Racing PRO VC-1 bead-seat clincher (BSC) works on a completely new tire retention system for bicycles (although the automotive industry has been using a similar system for decades). The BSC system relies on the inner diameter of the tire chamber registering the tire's bead instead of the outer edge of the rim. So the 7,975 pounds of total force for a tire inflated to 145 psi is directed inward toward a more secure position on the rim where it sits on a perch located on the inner diameter of the rim chamber. But Lew racing didn't stop there with its PRO VC-1 rims. Ever PRO VC-1 contains three times the amount of material in the sidewall and tire interface region than a traditional clincher. Which means that the sidewall is not subject to compression as a significant stress but rather tension, which is a composite's inherent strength. In addition, Lew Racing uses reinforced boron and high-modulus carbon in its rims which guards against rim deformation under extreme braking condition. Plus, because the PRO VC-1 is built to direct the tire's bead toward the bottom of the rim chamber where it is more secure as opposed to forcing the bead outward toward the rim's detachment point (as in traditional clincher rims) it eliminates the possibility of a clincher tire detaching from a PRO VC-1 rim. Making the PRO VC-1 the safest clincher composite wheel on the market. "Through all of our tests both in the lab and out on the pavement, the PRO VC-1 is the ultimate clincher wheel both in ride and in safety," says Paul Lew, Founder of Lew Racing. "Cyclists really feel the difference when riding the PRO VC-1." The PRO VC-1 is also extremely light weight, at less than 1,099 grams per wheelset. In addition, for riders up to 200 pounds custom spokable clincher rims with a spec weight of 380 grams are available for order. For more information on all Lew wheels, contact Lew Racing at (702) 581-5405 or go to www.lewracing.com. 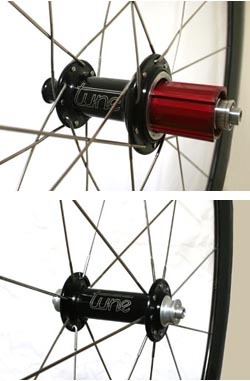 Paul Lew began designing and manufacturing bicycle wheels in 1991. Eleven years ago he developed the Race Lite, a 34 Msi carbon rim - the first and original unidirectional carbon fiber rim. Lew introduced his hybrid 34 Msi and 43 Msi carbon Sub One wheel in 1998 as the first production 1000 gram wheel set. In 2008, Lew Racing has been named an official sponsor of Rock Racing.